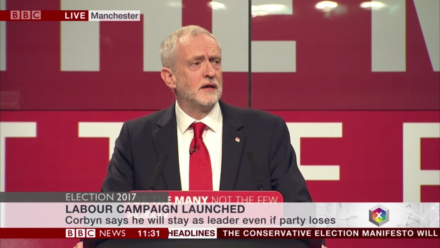 This is the full speech delivered by Labour leader Jeremy Corbyn at the party’s campaign launch in Manchester. It’s great to be launching our campaign in Greater Manchester where you showed the way for the rest of the country by electing a Labour mayor, Andy Burnham. Andy will be a great mayor – but just think how much more he will be able to achieve if he is working with a Labour Government committed to the many not the few. We have four weeks. Four weeks to take our message to voters to convince them Britain can be better. It can be transformed. It doesn’t have to be like this. We can transform Britain into a country that – instead of being run for the rich – is a one where everyone can lead richer lives. And I mean richer in every sense. Richer because all of us have potential to fulfil, family to support, interests to pursue, richer when that potential is not held back. Because there is no doubt; Britain is being held back. If your children aren’t getting the education they deserve because class sizes are too high. Then your children are being held back. If you’re a young couple, or anyone trying to get a home and can’t make a home because rent and house prices are too high. Then you’re being held back. And if you’ve worked hard all your life, but can’t pursue your dreams in retirement because you’re supporting your family well into adulthood. Then you too are being held back. But Britain is a rich country – the sixth richest in the world. We caught a glimpse of that wealth only two days ago when Rupert Murdoch’s Sunday Times published its Rich List. In the last year, Britain’s 1,000 richest people have seen their wealth rise by 14 per cent to £658 billion – that’s nearly six times the budget of our NHS. Imagine the outcry if public sector workers put in for a 14 per cent pay rise. But it’s no surprise that the richest have got even richer after the tens of billions the Tories have handed them in tax cuts. That’s what we mean when we say the system is rigged for the rich. So thanks for making that clear, Mr Murdoch – though I imagine it’s the only help you will give us in this campaign. In fact, we expect hostility. Our challenge to a rigged system is bound to meet hostility. Change always involves taking on vested interests. And there is a real danger that the Tories’ fearmongering and spin machine will make some people settle for less than they should. Resign themselves to things the way they are – underestimating just how many more burdens the Tories could impose if their mission to rig the system for the rich isn’t halted. The stakes are high. We know from last week’s local elections how big the challenge is. We have to convince the sceptical and undecided. They are not sure which way to turn. People are alienated from politics and politicians. Our Westminster system is broken and our economy is rigged. Both are run in the interests of the few. Labour is under attack because we are standing up to the elites who are determined to hijack Brexit to pay even less tax and take even more of the wealth we all create. Labour is under attack because we are standing up to the corporate interests plundering our NHS. How much more will be privatised if the Tories get another five years? We’re drawing a line. Three decades of privatisation – from energy and rail to health and social care – has made some people very rich but it has not delivered richer lives for the majority. In the coming days, we will be setting out our plan to transform Britain – with an upgraded economy run for the many not the few. Theresa May thinks she can dodge the Tory record by claiming she wants to build a fairer Britain, that she cares about working people. But does she think people will forget how the Tories have actually treated working people? It was this Tory leader who sat alongside David Cameron in government for six years. She was with him when they introduced the bedroom tax. What’s remotely fair about the bedroom tax? What was fair about racking up tuition fees? Or about taking benefits away from people with disabilities? Or about closing Sure Start Centres. Or starving schools of cash. Or opening up the NHS to be feasted on by profiteers. In case their talk of fairness doesn’t wash, they have another card to play. That this election is all about Brexit and who can play at being toughest with Brussels. Labour will not allow the Tories to put their party interests ahead of the real national interest; the interests of the British people. Labour wants a jobs-first Brexit. A Brexit that safeguards the future of Britain’s vital industries, a Brexit that paves the way to a genuinely fairer society, protecting human rights, and an upgraded economy. A big deal to upgrade the economy: new infrastructure to support the industries of the future. And an investment in training and skills to equip our workforce to compete globally. It means rebuilding our NHS and social care services with the funding they need. It means building a million homes to rent and buy. And it means tackling the scandal of air pollution which contributes to 40,000 deaths per year. We won’t be paying lip-service to working people. We will introduce a comprehensive programme to strengthen rights at work, make sure new jobs are good jobs, and end the race to the bottom in pay, conditions and job security. Low pay and insecurity have spread like an epidemic under the Tories. Labour will invest in skills and jobs, and take action to enforce a floor under employment standards across the board – so that all jobs are decent jobs, so that all workers – the true wealth creators – can play their part in transforming Britain and benefit fully from it. That’s why we are fighting to win this election. So we can transform Britain for the many not the few. When we win, the British people win. The nurse, the teacher, the small trader, the carer, the builder, the office worker win. Labour is offering a real choice, a real alternative to the rigged system holding us back and to the Conservatives who are running our country down. The economy is still rigged in favour of the rich and powerful. When Labour wins there will be a reckoning for those who thought they could get away with asset stripping our industry, crashing our economy through their greed and ripping off workers and consumers. When did the Conservatives – David Cameron, George Osborne, Theresa May, Boris Johnson – ever stand up to their financial backers and demand our money back? Never and they never will. Instead, they make others foot the bill – they make our nurses, our carers, our soldiers, our disabled, our young people trying to get a home of their own, our elderly looking for dignity in retirement and those working hard to get on, foot the bill. It makes me angry. And I know it makes the people of Britain angry too. So today, I say to tax cheats, the rip off bosses, the greedy bankers; enough is enough. In this election, Labour is standing for decent jobs, investment for the future, shared wealth creation, security at work, affordable homes for all, a fully funded NHS and schools, training and skills, an end to rip-off privatisation, fair taxation and a fairer, more equal country. As we set out our detailed plans for Britain, the scale of the change we are offering will become clear. So let’s turn our country around. Let’s come together to transform Britain. Together, we can win for the many not the few. Don’t wake on up on 9 June to see celebrations from the tax cheats, the press barons, the greedy bankers, Philip Green, the Southern Rail directors and crooked financiers that take our wealth, who have got away with it because the party they own, the Conservative Party, has won. We have four weeks to ruin their party. We have four weeks to have a chance to take our wealth back. We have four weeks to show what kind of country we are. We know that the people of Britain don’t pass by on the other side. That is the principle we will take into government so that we can unlock every person’s potential and everyone can make their best contribution to our society. We have four weeks to win and transform Britain for the many not the few. We must seize that chance.